is the title of a thick book being written by the HOME ARCHITECTS ®. As the name suggests, it is all about how you can manage the design process and construction process of your residential project. 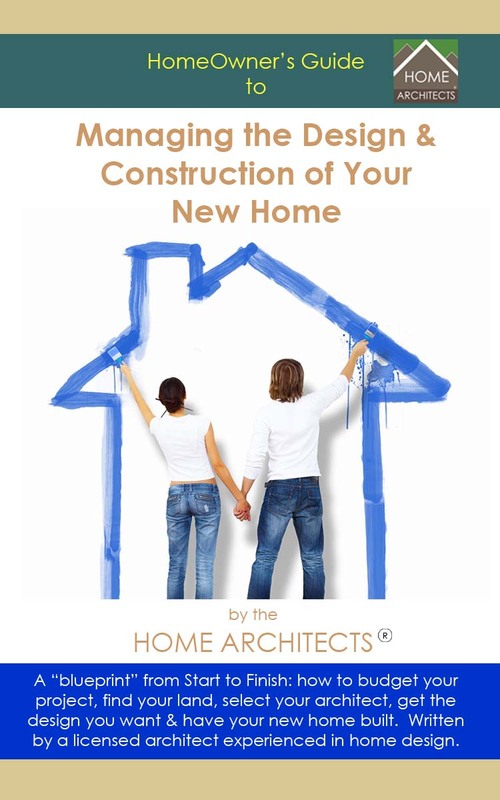 HomeOwner’s Guide to Managing the Design & Construction of your New Home, (C) Copyright 2012-2014 Home Architect, PLLC, All Rights Reserved Worldwide. Coming soon. In the meanwhile, check out the other e-books produced by this company. Click on the cover above to see a preorder landing page that this will link to for your interest. Ordinary people, developers and and Builders across the USA had an unprecedented boom of activity during 2003-2008. Then for about 6 years, there was a lull. Now, in 2014, there appears to be a resurgence of interest, actual design, construction of new houses and renovations and additions. And many of these people, especially lay people wanting to have houses designed and built, want guidance and useful information about how to accomplish this. The book, HomeOwner’s Guide to Managing the Design & Construction of your New Home, provides this guidance. Soellner at first wrote most of book in a how-to format: “do this, do that, then you’ll have this.” However, he realized that it needed to be more entertaining, using characters’ names, to personalize it more and make if more human. So, he now is rewriting the entire 300+ page text. It may not be available for another couple of years. In the meanwhile, the architectural company produced a series of much shorter downloadable e-books covering a range of subjects and the combined total of all of these is well over 100 pages. So: there is some good information already available. Click here to see the company–> Bookstore. The other e-books include subjects such as a project planning guide, how to hire an Architect, how to hire a Contractor, a client centered design process book, and possibly more on the way. The question of why use an e-book format? “E”= Electronic. These books typically are not intended for hardcopy print on paper. This architectural firm is a “green” (environmental) design firm, therefore prefers to not do things that result in more trees being cut down to have paper on which to print, nor to have to consume ink, shipping of a physical product, and other resources. The e-book download first requests the you provide your name, email and state. The company also provides you with a bonus free subscription to a once-a-month e-magazine (always free), that provides useful information to people thinking of planning, designing and building residential projects. This architectural firm has the largest online presence of residential architecture in the world, for a professional, licensed, architectural company offering house design services. The company offers not only multiple publications, but also a project index of their designs, weekly updated online posts and an archive of hundreds of previous posts on hundreds of subjects about residential design construction and maintenance. Tags: custom, cashiers, highlands, lake toxaway, glenville, atlanta, hendersonville, asheville, aspen, telluride, new bern, lake wales.